Proceeds from the Pet Friendly plate go directly to fix Hoosier pets through the life-saving programs offered by Spay-Neuter Services of Indiana. 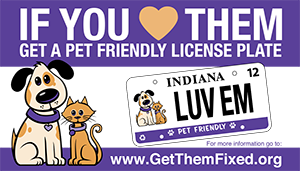 The Pet Friendly license plate is $40, with $25 going directly to SNSI. The plate is available online at myBMV.com and at your local BMV locations.